Local historian Harry Thomas, Nant Hall Road, of Prestatyn has written about the Beatles’ visits to the area. 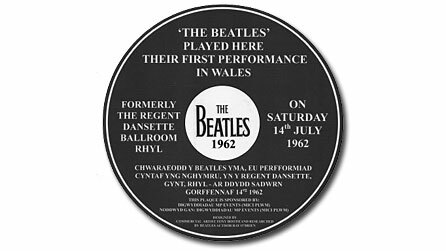 He said: “The first time the Beatles played in Wales was at Rhyl on July 14, 1962 at Regent Dansette, which was a popular club above Burton’s on the High Street. Also on the bill were a local group called The Strangers. The audience included a mix of tourists and locals, and were most likely primarily there to dance rather than listen to the group. 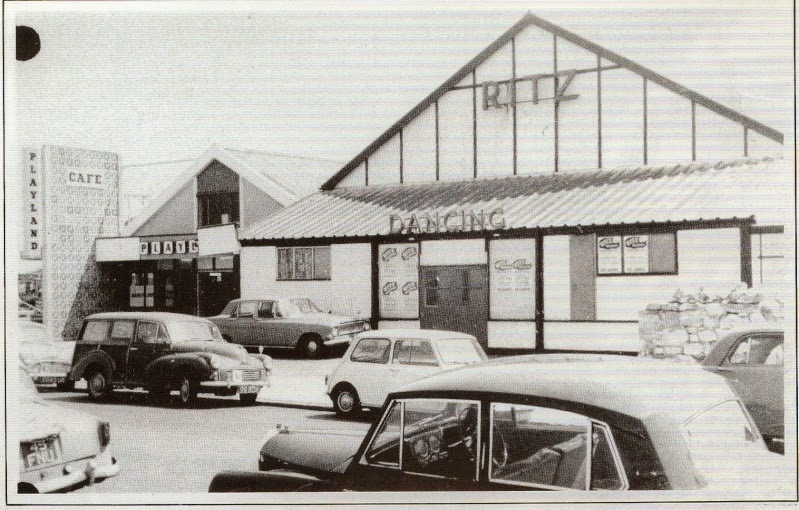 The band, who went on to become one of the most popular groups in the world, also played at the Royal Lido, Prestatyn, now the Nova, in 1962. Over the last five years there has been a significant increase in the price of Beatles memorabilia, Lynsey Wilkins, from music memorabilia company Tracks, said: “A Beatles concert poster from Rhyl in decent condition could now bring £4000 to £5000, compared with £2000 five years ago, a small ticket stub £50, a larger, more elaborate one such as those that were issued in 1962 or early 1963 would bring around £150. “Beatles programmes bring between £25 and £35, with handbills realising between £300 and £500. 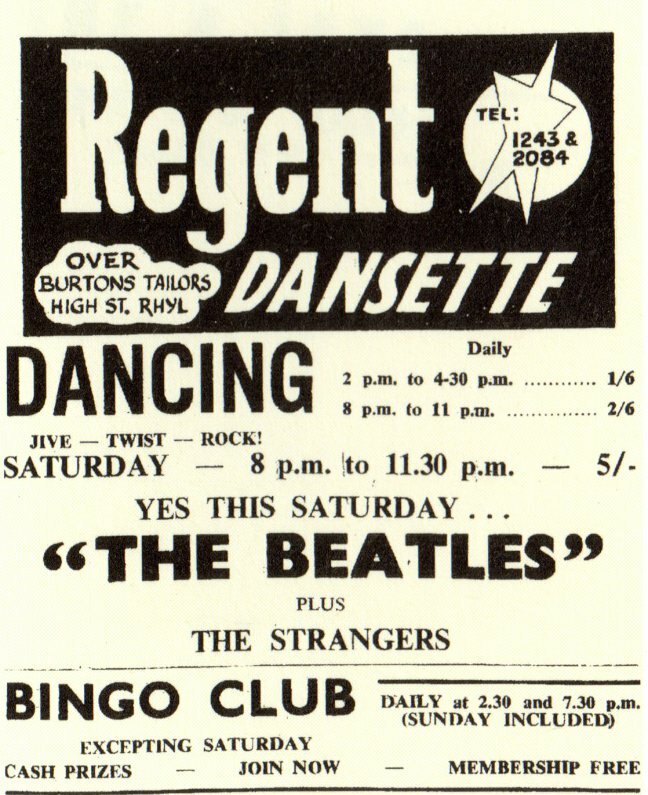 JoAnne Francis, Rhyl: My grandfather had the Regent Ballroom in Rhyl and the Beatles played there before Ringo joined the band. 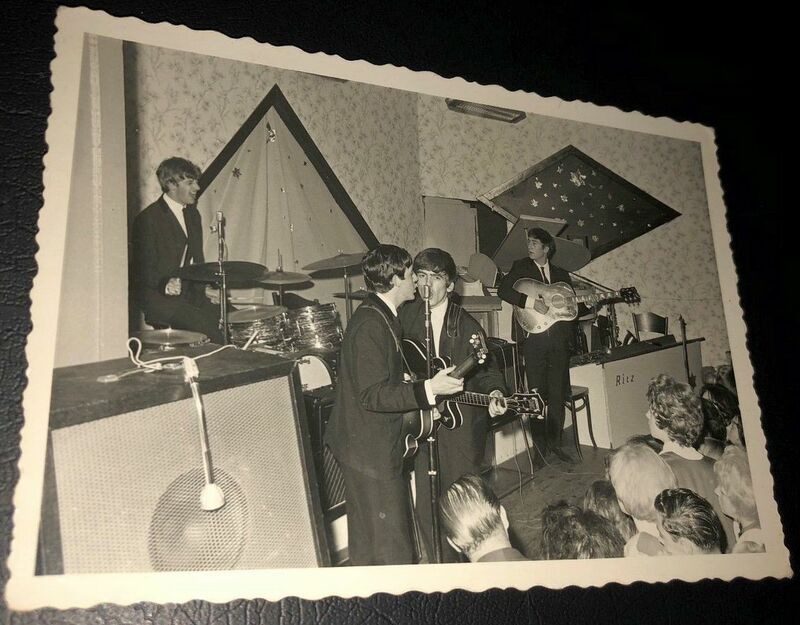 The stage was wood built over the billiard tables and my nan said during the day John Lennon was playing classical music on the piano, and lots of girls arrived to see them before the gig and my nan sent them away. Richard Evans: I saw The Beatles – with Pete Best on drums – at the Embassy Dansette Ballroom in Rhyl on 14 July 1962. I think it cost 2/3 to get in – that’s about 14p today. They were supported by local band The Strangers. Jess Ballard, Holywell: I was working in the cash box [at Rhyl] at the time and so was my husband, the band leader who went under the name ‘Duke Gordon and the Ritz Showband’. The main Beatles hits at the time I believe were ‘Please Please me’ and ‘Love Me Do’. Brent Davies: The Beatles came to Rhyl in the early 60s just before they became famous, and to get a bit more cash they crossed the Foryd Bridge and came to The Clwyd Hotel (now The Harbour) and asked my dad, Haydn Davies, who was the first licensee on the North Wales coast to put on cabaret in a pub, for some extra work. But dad being dad turned them away saying ‘I’m not having long haired yobos like that in my pub!’ Oh if he only knew.